Built with the aid of local industrialist and philanthropist, Mr. J.D. Chauhan-Bytco, Muktidham temple is and impressive marble temple complex consisting of 12 temples, each pertaining to one of the 12 Jyotirlingas of India. There are 18 chapters of the Hindu text the Bhagavad Gita written on walls throughout the temple. 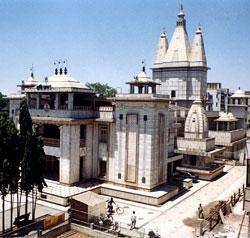 The temple is located in the suburbs, approximately 7km south of Nashik.